Charlize Theron is one of the cover stars of ELLE's Women In Hollywood issue, so naturally she was on hand for the 25th Annual celebration at the Four Seasons Hotel last night(October 15th) in LA. The actress donned a chic, edgy masculine inspired look courtesy of CHRISTIAN DIOR. 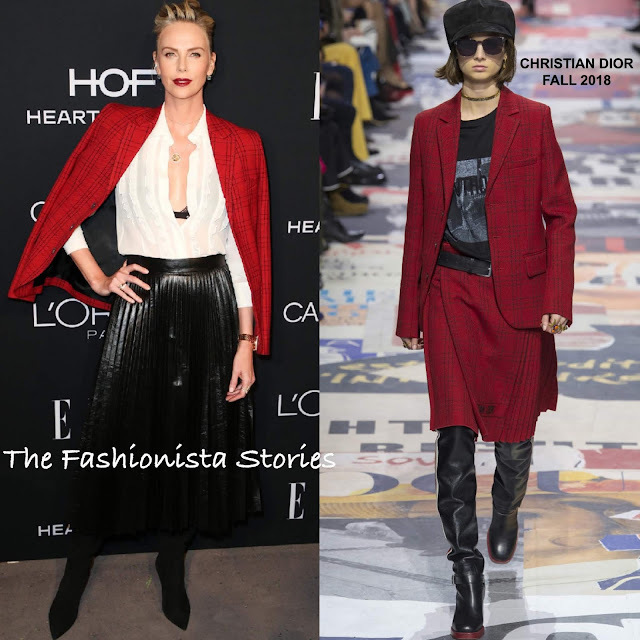 She wore a FALL 2018 red plaid blazer, a white ruffle, half button shirt and a black leather pleated skirt. Beauty wise, she went with a complimentary up-do and a red lip which topped off her look along with ANA KHOURI jewelry and black knee high boots.